Another decadent bottarga lunch. 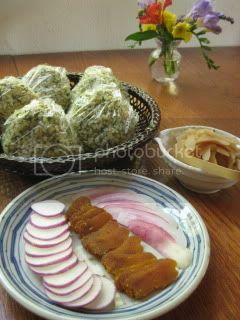 This time, I made Bottarga & Green Tea Onigiri (rice balls). 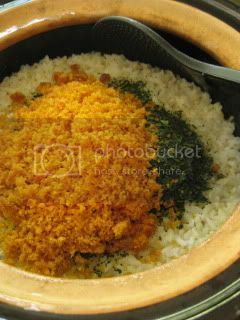 I first made half & half (brown and white) rice with my double-lid donabe rice cooker, "Kamado-san". 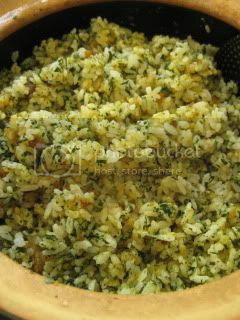 Then, I added grated bottarga and green tea leaves (toasted in a pan beforehand) to the rice. The aroma was really nice. 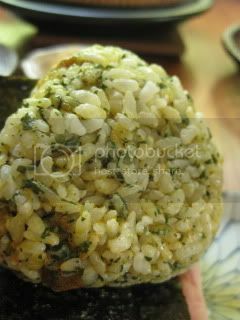 The mixed rice was made into onigiri (rice balls) and we just wrapped each with nori (roasted seaweed) to enjoy. I also served some sliced bottarga with sliced radish (they are really nice together). I wish I could have this lunch every day! 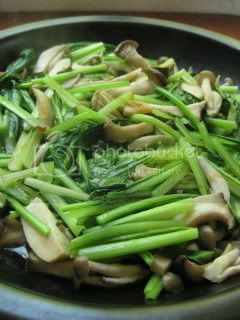 Side dish was simple steam-fry komatsuna (Japanese spinach) with eryingi mushrooms. 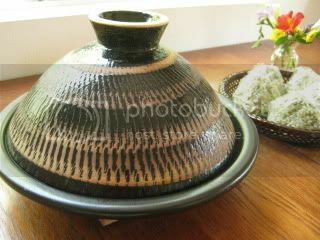 It was coked with my tagine-style donabe, "Fukkura-san". I drizzled a little amount of donabe-smoked soy sauce to finish again.